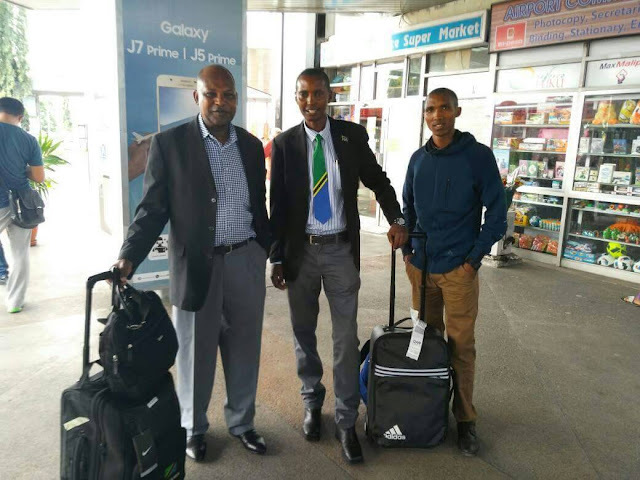 L-R, Coach Francis John, Secretary General Athletics Tanzania, and Alphonce Simbu . Geoffrey Kirui won the 2017 world men’s marathon title – becoming Kenya’s fifth champion in the event - after winning a testing duel in the sun with Ethiopia’s Tamirat Tola over the four-loop course that began and ended on Tower Bridge, where he finished in 2:08:27. In so doing, the 2017 Boston Marathon winner extended his country’s record as the most successful nation in the history of this event at the IAAF World Championships. Tola, the Olympic 10,000m bronze medallist and fastest in the field thanks to the 2:04:11 he recorded in winning this year’s Dubai Marathon, required medical treatment after struggling home in 2:09:49, just two seconds ahead of Tanzania’s Alphonce Simbu, who clocked 2:09:41. Home runner Callum Hawkins, who had featured intermittently in the lead through the first half of the race, finished strongly for fourth place in a personal best of 2:10:17. "This is the best moment of my career, easily,” said Kirui. “I am so happy to win the world title because it is my first time at these championships. This was the best course and the best crowd I have seen at a marathon. "I was not expecting to be world champion. I feared the Ethiopian because he had such a fast time, so I just followed my plan to 35km and then felt my body to see how I was doing. Good for me it responded well. "I was smart not to follow the Ethiopian. When he tried to take off, I knew I had to hit my target at 35km then I started to move. "Winning this title has been my goal for so long. Now my goal will be to repeat it." Simbu was also understandably jubilant. "I am very, very happy,” he said. “This was my focus. I thank God because he protected me, gave me power and strength. I think Tanzanians are over the moon now because this is a great day for us. For Hawkins, it was a day of mixed emotions. "It was tough,” he said. “The support was crazy. Over the last 5km I couldn't even hear my own footsteps. It was pretty ridiculous out there but brilliant to come out in front of a home crowd. "Maybe I left it a bit late and should have covered the big move at half-way a bit more, but I felt at the time it would have destroyed me had I done it. Ethiopia have only won this race once – through Gezahegne Abera in Edmonton in 2001. But as the race reached its three-quarters point it looked as if Tola was going to double that record. The Ethiopian then opened up a lead of about 20 metres, and Kirui’s demeanour seemed to indicate that the decisive moment had occurred. Not so. Kirui led Tola by a stride as they passed under the railway bridge for the fourth and final time. As they emerged, he had a decisive lead of about 20 metres, and never faltered from that point on.